Watching Jack sleep is our FAVORITE! 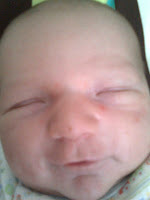 He always makes really funny faces so I'm guessing newborns can kind of dream. Sometimes he makes really sad faces and pouts out his lower lip like he's going to cry and sometimes he'll smile over and over again (probably dreaming that mama was producing chocolate milk...that would be sweet). I love watching them sleep! He's getting his last few instructions from Heaven, is what I decided, some of them make them excited and they smile, some of it is probably scary and they frown... So sweet! I think I just watched your video 4 times in a row. Baby Jack is my favorite Jack! ;) Love you guys.